Walking to a meadow, you can glimpse Hinckleys Pond through the trees. Sophie’s father Everett Eldredge points to where a snapping turtle had dug a nest. It’s been scavenge d, the eggs have dried out, becoming bone-like shards. “There was a cellar hole, a structure here,” he says. Clearly, the land holds a story for both people and wildlife meandering its contours over time. Twenty years back, Eldredge sold his neighbor Jacob Brown five acres of the land adjacent to Sophie’s Corner. 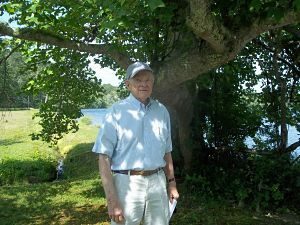 Brown added acreage and to help qualify for a state income tax credit of up to $75,000, he donated 7.2 acres to The Compact of Cape Cod Conservation Trusts, a regional land trust service center that works locally on behalf of the nonprofit Harwich Conservation Trust. The Compact will soon transfer the land to Harwich Conservation Trust (HCT), which will permanently preserve the woodland landscape rambling down to Hinckleys Pond. In homage to the Eldredges’ Sophie’s Corner, the Browns had also always referred to the land as Sophie’s Corner. Trekking into the seven acres the light filters through swamp red maples, sumac, white and red oak, blueberries high and lowbush, sheep laurel; sun bounces off shiny black cherry leaves, and lingers in some pitch pine. Eldredge who is part Wampanoag, part descendant of the family which settled Chatham says, “Native peoples encamped here. They must have. We’ve found arrowheads. It’s a protected place in winter. There’s water and fish.” He mentions a dig from years ago; he can’t find out much about it, but it was somewhere near here. 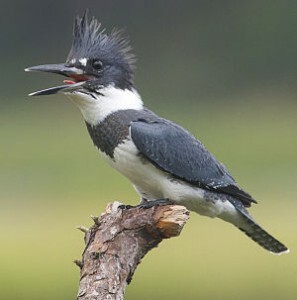 Kingfishers fly by with their energetic chattering call. Brown and Eldredge tell me about a resident bald eagle, and of osprey who hunt fish here, sitting on dead snags, soaring on the southwest winds. “There are deer, foxes whipping through,” Brown’s wife Barbara says. There have been coyotes and quail in the past. There’s a colony of egrets. Eldredge has seen otters, fishers, muskrats, screech and great-horned owls, too. The parcel helps buffer the headwaters of the Herring River. We can’t get through the jungle of woods to the river. Brown says efforts to restore the river herring population are making progress. Barbara loves to watch the herring come into the pond where they’ll spawn and then swim out downstream via their namesake Herring River. 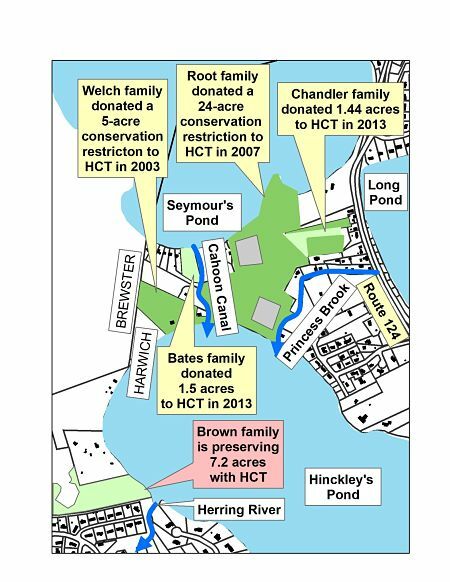 Sophie’s Corner is across the pond from several hundred feet of shoreline permanently protected by the Root and Welch families, each of whom donated conservation restrictions to HCT. This area is near the much larger Punkhorn Parklands (~900 acres), conservation land owned by the Town of Brewster. The homes of the Browns and Eldredges sit amongst the tall trees on private property overlooking Hinckleys Pond. Brown’s 40-acre private holdings include a working bog leased to an Ocean Spray grower who harvests from 450 to as much as 1600 barrels of cranberries annually. A cranberry red cottage sits by the water while a modest board and batten house built in 1962 is perched on a bluff overlooking the water. It’s easy to get lost while driving the dirt roads out to the bog and cottage, passing through Harwich, a slice of Brewster, and then back to Harwich. Even though a map shows definitive town boundaries, the woodsy hinterland looks uninterrupted by lines crafted by municipal consent centuries ago. And Brown’s sister once ended up in a bog, where she fed herself plum pudding with a pencil until she was rescued. Brown’s a vibrant 83. He grew up summering in Wychmere Harbor, and living in Chestnut Hill the rest of the year. He’s worked for the same investment firm for 47 years. 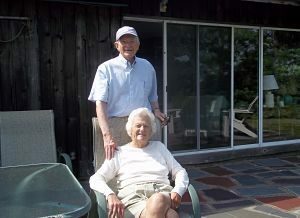 After marrying Barbara, a beautiful New Hampshire girl who spent plenty of time on Lake Winnepesaukie, at the urging of Brown’s brother, they bought the first pond acreage. Eldredge mirrors the mutual appreciation by saying, “The Brown family’s a godsend. They’re caring wonderful people who helped out in hard times.” He adds that Jacob’s brother Chuck who died at 98 (but who, Brown wryly comments, “thought he had made it to 100”) was a counselor at Gunny’s camp. By preserving the land’s wildlife habitats and scenic pond shoreline, local land trusts like HCT also help to preserve the human history connected to land and water. Jake and Barbara Brown are pleased that the landscape will be preserved in perpetuity, helping to protect the water quality of Hinckley’s Pond and the Herring River which at just a stone’s throw away, begins its journey from the pond to Nantucket Sound. And when spring arrives, the river herring will make their way upstream to spawning destinations like Hinckleys Pond where they will now have 300 feet more of protected shoreline habitat thanks to the Browns, The Compact, and HCT.